Steam trains in north Wales were forever immortalised in the 1950’s by Oliver Postgate’s animated series “Ivor the Engine”, and still today, the steam trains of the Ffestiniog Railway huff and puff their way through the mountain scenery of Snowdonia. Porthmadog is a small town, in the crook of the Lleyn Peninsula in North Wales and is home to the narrow gauge Ffestiniog Railway, which was founded in 1832, making it the oldest independent railway company in the world. Originally built to transport slate from the mines of the mountain town of Blaenau Ffestiniog to the shipping port of Porthmadog, the Ffestiniog Railway has been an incredibly popular tourist attraction since the 1920’s and is now a leader in railway preservation. Whether you’re a railway enthusiast or simply looking for a day out with a slice of history, then adults and kids alike will fall for the charms of these proud, shiny little steam trains. Although once famed for its ship building and slate exporting trades, Porthmadog is now a town heavily reliant on summer tourists. Visitors will need to look beyond the shabby high street pubs and pound shops to find a charming town proud of its heritage and a deep rooted tradition of Welsh language. The high street is the usual mix of cheap tourist shops, run down take-aways and redeveloped boutique style gift shops. The Portmeirion gift shops are also a haven for quirky souvenirs, and Browsers is a fabulously old-fashioned bookshop filled with literary treasures. If you’ve come to enjoy the stunning mountains of Snowdonia National Park, then you’ll find everything you need at adventure mega store Outdoor World. After all that shopping, you’ll probably need some sustenance! The best places for lunch are the Big Rock Café or the Grapevine Café. If the sun is shining, then opt for a take-away sandwich from Jessie’s and stroll up to the historic harbour for lunch with the seagulls. 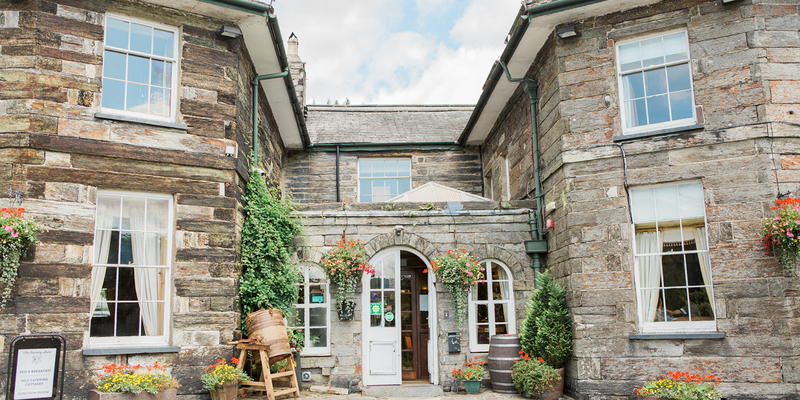 For something more substantial, there are a couple of restaurants worth mentioning – Yr Hen Fecws (literally meaning “The Old Bakery”) serves fantastic bistro style food, with main courses costing between £9 and £15, as does the Moorings restaurant in nearby village Borth-y-Gest. Average pub food is available at the Ffestiniog Railway station pub called Spooners or in the harbour-side pub, Y Pencei. As previously mentioned, no trip to Porthmadog would really be complete without a day out on the railway! The journey begins at the harbour station in Porthmadog, and is a 13 and a half mile leisurely saunter to the once thriving slate town of Blaenau Ffestiniog. A single trip takes just over an hour and the cost for an adult ticket is £17.50 for an all day rover (you can get on and off as many times as you like) or £14.50 for a standard return. One child under 16 travels free with each paying adult. Blaenau Ffestiniog is an interesting town, although is now known more for its dilapidated state than its industrial grandeur, although the imposing architectural evidence of a once wealthy era is stunning. Half a day can easily be spent exploring the town, longer if you plan to take in the Llechwedd Slate Caverns, which are well worth a visit. So, you’re all steamed out, but there’s still lots more things to do that will interest the keen explorer! Borth-y-Gest is a beautiful little village, within easy walking distance (about 20 minutes) from Porthmadog. Head up to the harbour, find the “Grisiau Mawr” (literally meaning “Big Steps” and they are big, see if you can count them! ), take a left turn at the top and admire the stunning views of Porthmadog. Carry along the road until you reach Borth-y-Gest where you can while away an afternoon at the tea rooms, or amble to the lovely beaches and coves. There are usually a handful of salty old sea dogs chattering by the harbour, and they’ll be happy to point you in the direction of the beach. The famous Italianate village of Portmeirion, is also well worth a visit. It’s a surreal mix of the Mediterranean, set in a welsh hillside, but its seemingly effortless beauty will soon bewitch you. It’s much better visited without the throngs of summer crowds, although you can escape them if you are willing to explore off-road, into the web of forests and exotic plants surrounding the village known as the “Gwyllt” (literally meaning “Wild”).